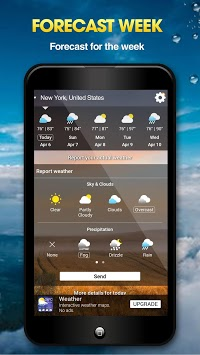 Weather App is a popular application with the utilities it offers. You will easily make decisions about going out and working when you know the weather forecast the next day, 7 days later. It's easy for you to plan a fun picnic with nice weather. 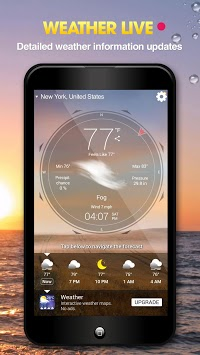 The live weather application provides a lot of useful features for you to use. - The weather information is updated weekly, daily, hourly with real time. - Weather forecasts for all cities: Washington, New York, California, San Francisco, Texas, Georgia, Florida, Ottawa, Hawaii, Toronto, Dallas, Nashville, Kansas City, London, Rome, Madrid, Oslo , Paris, Nancy, Dijon, Brest, Marseille, Rennes, Reims, Chamonix, Lyon, Metz, Grenoble, Strasbourg, Berlin, Tokyo, Singapore, Hong Kong, Hanoi, Ho Chi Minh, Da Nang, Phu Quoc, Ha Long. ..
- Full report. 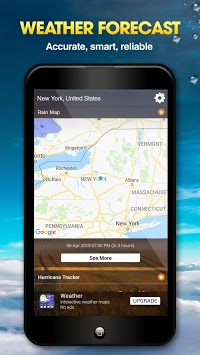 Shows all weather information: time position, temperature, atmospheric pressure, weather conditions, vision distance, relative humidity, rainfall in different units, dew point. The application is also designed to be easy to use, making you feel comfortable when using. The application is now available for free on google play store, you can download and use it now!